John Stephen Goodman (born June 20, 1952) is an American actor. Early in his career, he was known for playing Dan Conner on the ABC TV series Roseanne (1988–1997; 2018), for which he won a Golden Globe Award for Best Actor in 1993. He is also a regular collaborator with the Coen brothers on such films as Raising Arizona (1987), Barton Fink (1991), The Big Lebowski (1998), O Brother, Where Art Thou? (2000), and Inside Llewyn Davis (2013). Goodman's voice roles in animated films include Pacha in Disney's The Emperor's New Groove (2000) and Sulley in Pixar's Monsters, Inc. (2001), and Monsters University (2013). His other film performances include lead roles in Always (1989), The Babe (1992), The Flintstones (1994) and 10 Cloverfield Lane (2016) and supporting roles in Coyote Ugly (2000), The Artist (2011), Extremely Loud & Incredibly Close (2011), Argo (2012), Flight (2012), The Hangover Part III (2013), Patriots Day (2016), and Kong: Skull Island (2017). On television, he has had regular roles on Amazon Studios's Alpha House and on the first season of HBO's Treme and has been a frequent host of Saturday Night Live, as well as playing guest roles on series such as Community. John Heilpern of Vanity Fair has called him "among our very finest actors". Goodman was born in Affton, Missouri. His father, Leslie Francis Goodman, was a postal worker who died of a heart attack when John was two years old. Goodman's mother, Virginia Roos (née Loosmore), was a waitress at Jack and Phil's Bar-B-Que, a retail store associate, and also took in laundry to support the family. Goodman has a sister, Elisabeth, and a brother, Leslie. He is of English, German, and Welsh ancestry. Goodman went to Affton High School, where he played football and dabbled in theater. After graduating in 1970, he took a gap year. He earned a football scholarship to Missouri State University (then-called Southwest Missouri State University, or, "SMSU") in Springfield, Missouri. He pledged to Sigma Phi Epsilon fraternity, although he did not join until several years later. He discovered the drama program and studied there with future Hollywood stars Kathleen Turner and Tess Harper. He remains close to his school friends. He graduated with a Bachelor of Fine Arts in 1975. After an injury ended his college football career, Goodman decided to become a professional actor and left Missouri for New York City in 1975. With a small bankroll from his brother, Goodman found an apartment in Hell’s Kitchen near the Theater District and unsuccessfully tried to make money as a bartender and waiter. However, he eventually found modest success in voice-overs, commercials, and plays. He was the person who slapped himself (uttering the tagline, "Thanks... I needed that!") in an iconic television ad for Skin Bracer by Mennen. Goodman also performed off-Broadway and in dinner theaters before landing character roles in film during the early 1980s. In 1982, Goodman made his film debut with a small role in Eddie Macon's Run. During this period he continued to work on the stage, starring as Pap Finn in Big River from 1985 to 1987. For his role, he received a Drama Desk nomination for Best Featured Actor in a Musical; he is also featured on the Original Broadway Cast Recording. Before landing his big break into movies in 1986 with a significant comedic role in True Stories, he had a brief cameo as Otis in Sweet Dreams. In the former film, his character Louis Fyne says "I'm 6' 3" and maintain a consistent panda bear shape", establishing his trademark size as an important part of many characters he would later play on film and stage. He voiced Robot Santa in the character's first appearance on Futurama. Beginning in 2007, Goodman has been the voiceover in Dunkin' Donuts commercials. In 2000, Goodman provided the voice of Pacha in Disney's The Emperor's New Groove and, a year later, the voice of Sulley in Pixar's Monsters, Inc. In 2009, Goodman voiced "Big Daddy" La Bouff in The Princess and the Frog. Goodman's voice can also be heard on an automated message system at Lambert-St. Louis International Airport. He was the original voice of the yellow M&M in 1995 before being replaced by J. K. Simmons the following year. In 2011, Goodman was a guest star on the third season of Community. He also voiced a character in the video game Rage voicing Dan Hagar, and played movie studio chief Al Zimmer in the Academy Award–winning live action film The Artist, as well as Best Picture nominee Extremely Loud & Incredibly Close the same year. Also in 2011, Goodman starred in Kevin Smith's Red State playing ATF Agent Joseph Keenan. In February 2012, it was reported that Goodman would reunite with Roseanne Barr for a new NBC pilot titled Downwardly Mobile. The series would have had Goodman portray a bachelor mechanic who resides in a trailer park, and would have used the standard multiple-camera setup traditionally found in sitcoms; however, the series' option was not picked up by the network. Other prominent roles include performances in Flight (2012) and The Monuments Men (2014). With his well-received supporting roles in The Artist (2011) and Argo (2012), Goodman accomplished the rare feat of appearing in back-to-back winners of the Academy Award for Best Picture. In 2013, Goodman received rave reviews for his performance as North Carolina Senator Gil John Biggs in Amazon's Alpha House, a political comedy written by Garry Trudeau. In the show Goodman's character, a retired UNC basketball coach, and three other Republican senators share a house on Capitol Hill. Goodman spent the summer of 2014 shooting Season Two. On March 10, 2017, Goodman received a star on the Hollywood Walk of Fame for his work in motion pictures, located at 6767 Hollywood Boulevard. On April 28, 2017 it was announced that a revival of Roseanne was in the works and that Goodman along with most of the original cast and some of the producers would return for the limited series that was being shopped around with ABC and Netflix the frontrunners to land the show. On May 16, 2017 it was confirmed that 8 episodes would air mid-season in 2018 on ABC. On May 29, 2018, in the wake of controversial remarks made by Barr on Twitter regarding Valerie Jarrett (an advisor of former president Barack Obama), ABC canceled the revival after a single season. The next month, ABC ordered a ten-episode Roseanne spinoff titled The Conners, which will star the Roseanne cast sans Roseanne Barr. Since Hurricane Katrina, Goodman has appeared in several recovery commercials aired in Louisiana. Goodman married Annabeth Hartzog in 1989. They are residents of the Garden District in New Orleans, Louisiana. Their daughter, Molly Evangeline Goodman, works as a production assistant in the film industry. Goodman was formerly known by his sizable frame, at one point weighing close to 400 lb (180 kg). However, by August 2010, he had lost 100 lb (45 kg). He lost the weight by exercising and keeping a journal of what he was eating. He has lost even more weight since then. His new figure attracted much attention when he appeared at the Toronto International Film Festival in September 2015 and the BFI London Film Festival in October 2015. 1990 Grand Red Episode: "The Healing"
1992 The Jackie Thomas Show Dan Conner Episode: "The Joke"
1999 The Simpsons Meathook (voice) Episode: "Take My Wife, Sleaze"
2001 Ed Big Rudy Episode: "Loyalties"
2006 Odd Job Jack Garbage Czar (voice) Episode: "The Big Dump"
^ a b c d e Heilpern, John (January 2014). "Out to Lunch with John Goodman". Vanity Fair. New York City: Condé Nast. ^ a b "John Goodman Biography (1952–)". Filmreference.com. Retrieved February 28, 2012. ^ a b "Loosemore/Loosmore Family:Information about John Stephen Goodman". Familytreemaker.genealogy.com. August 15, 1996. Retrieved February 28, 2012. ^ "John Goodman Biography – Yahoo! Movies". Movies.yahoo.com. Retrieved February 28, 2012. ^ a b c d e Goodman, John (September 14, 2003). "John Goodman". Inside the Actors Studio (Interview). Interviewed by James Lipton. New York City: Bravo. ^ a b c McGrath, Charles (April 19, 2009). "Big Man Tries Beckett". The New York Times. New York City: New York Times Company. Retrieved February 14, 2013. ^ Gtes, Megan (December 14, 2012). "Actor, alumnus John Goodman to receive honorary doctorate from MSU". The Standard. Springfield, Missouri: Missouri State University. Retrieved October 18, 2018. ^ Armstrong, Lois (November 28, 1988). "Playing Second Fiddle to TV Wife Roseanne Barr, Big John Goodman Finally Gets a Taste of Fame". People Magazine. Retrieved 13 February 2019. ^ John Goodman Biography – Yahoo! Movies. Movies.yahoo.com. Retrieved on February 7, 2011. ^ O'Brien, Conan (Host); Goodman, John (Guest) (September 13, 1993). Late Night With Conan O'Brien (Television program). New York City: NBCUniversal – via YouTube. ^ Evans, Bradford (April 18, 2013). "The Lost 'SNL' Cast Members: Part 1 (1975–1995)". Splitsider.com. Retrieved 2013-11-24. ^ Vitcavage, Adam (October 31, 2011). "John Goodman To Reunite With Coen Brothers". Paste Magazine. Avondale Estates, Georgia: Wolfgang's Vault. Retrieved August 19, 2012. ^ "John Goodman Emmy Nominated". Emmys.com. Retrieved February 28, 2012. ^ "Nevada Day, Part 1 –". TV.com. Retrieved February 28, 2012. 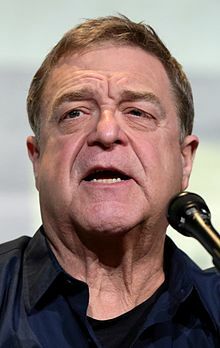 ^ "John Goodman". St. Louis Walk of Fame. Retrieved February 28, 2012. ^ "Who's The Celebrity Voiceover In That Commercial?". ScreenCrush. Greenwich, Connecticut: Townsquare Media. Retrieved February 28, 2012. ^ Schneider, Michael. (April 22, 2010) Another tasty TLC entree – Entertainment News, TV News, Media. Variety. Retrieved on February 7, 2011. ^ "7 Actors Who Voiced M&Ms". mentalfloss.com. 2015-02-27. Retrieved 2019-01-26. ^ "Roseanne's John Goodman and Roseanne Barr reunite for NBC's "Downwardly Mobile"". Unreality TV. February 11, 2012. Archived from the original on February 13, 2012. Retrieved February 11, 2012. ^ Ford, Rebecca (July 10, 2013). "Steve Jobs, Billy Crystal to Receive Disney Legends Awards". The Hollywood Reporter. Los Angeles, California: Eldridge Industries. Retrieved July 18, 2013. ^ Goodman, Tim (November 14, 2013). "Alpha House: TV Review". The Hollywood Reporter. Los Angeles, California: Eldridge Industries. Retrieved July 24, 2014. 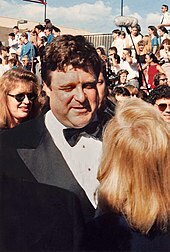 ^ "John Goodman Receives Star on Hollywood Walk of Fame". NBC Southern California. Retrieved March 11, 2017. ^ Scott, Mike (March 10, 2017). "John Goodman gets star on Hollywood Walk of Fame". nola.com. New Orleans, California: Nola Foundation. Retrieved March 11, 2011. ^ Variety (March 13, 2017). "John Goodman - Hollywood Walk of Fame Ceremony" – via YouTube. ^ Keveney, Bill (April 28, 2017). "'Roseanne' revival may be in the works". USA Today. Mclean, Virginia: Gannett Company. Retrieved April 28, 2017. ^ Pallotta, Frank; Stelter, Brian (May 29, 2018). "ABC cancels 'Roseanne' after star's Twitter comments". CNN Money. Atlanta, Georgia: Turner Broadcasting Systems. Retrieved May 29, 2018. ^ Park, Andrea (May 29, 2018). "ABC cancels "Roseanne" after Barr's tweet". CBS News. New York City: CBS Interactive. Retrieved May 29, 2018. ^ Duster, Chandelis R. (May 29, 2018). "ABC cancels "Roseanne" after show's star compared Obama adviser to 'ape'". NBC News. NBCUniversal. Retrieved May 29, 2018. ^ Goldberg, Lesley (June 21, 2018). "ABC's 'Roseanne' Spinoff Officially a Go — Without Roseanne Barr". Eldridge Industries. Los Angeles, California: Penske Media Corporation. Retrieved June 21, 2018. ^ Plaisance, Stacey (March 8, 2006). "'Fall in Love with Louisiana All Over Again'". NBC News. New York City: NBCUniversal. Retrieved October 18, 2018. ^ Chang, Cindy (July 20, 2010). "In 'Be the One' video, Sandra Bullock, Drew Brees, Lenny Kravitz come together for the Gulf". nola.com. New Orleans, Louisiana: NOLA Media Group. Retrieved October 18, 2018. 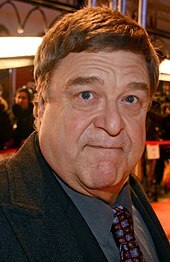 ^ "The Southern A-List: John Goodman". Garden & Gun. Retrieved 2016-03-25. ^ a b Yuan, Jada (October 28, 2012). "John Goodman, Fall's Busiest Supporting Actor, Needs a Cigarette". Vulture.com. New York City: New York Media. Retrieved October 18, 2018. ^ a b Jacobo, Julia (October 10, 2015). "Once 400-pound John Goodman debuts dramatic weight loss at London film festival". WPIX. New York City: Tribune Broadcasting. Retrieved October 12, 2015. ^ Hamm, Liza (August 5, 2010). "John Goodman: How I Lost 100 Lbs. — and Counting". People. New York City: Meredith Corporation. Retrieved February 28, 2012. ^ "The Hudsucker Proxy". March 11, 1994 – via IMDb. ^ "Movie Review: Dirty Work(1998)". Entertainment Weekly. New York City: Meredith Corporation. March 1, 1998. Retrieved August 2, 2012. ^ Bay, Michael (May 8, 2014). "John Goodman And Ken Watanabe Join The Autobot Voice Cast in Michael Bay's 'Transformers: Age Of Extinction'". Michael Bay. Retrieved May 8, 2014. ^ "The Academy of Science Fiction Fantasy and Horror Films". www.saturnawards.org. Retrieved 3 March 2017. ^ "Transformers: The Last Knight Director Confirms John Goodman, John Turturro Returns". Retrieved January 6, 2017. ^ Lynch, Jason (7 February 2014). "John Goodman on getting wooed by Clooney and bunking with Bruce Willis". The A.V. Club. The Onion, Inc. Retrieved 7 February 2014. ^ Gray, Tim (September 29, 1993). "Review: 'Grace Under Fire'". Variety. Retrieved March 24, 2017. ^ Mitovich, Matt Webb (August 28, 2011). "Community Sneak Peek Video: John Goodman Tells the Dean 'Wassup'". TVLine. Retrieved August 29, 2011. ^ "'Monsters, Inc.' Voice Cast to Return for Disney+ Series (Exclusive)". The Hollywood Reporter. Retrieved 2019-04-09. ^ Saltzman, Marc (March 1, 2011). "Five things you didn't know about Rage". USA Today. Mclean, Virginia: Gannett Company. Retrieved March 3, 2011.